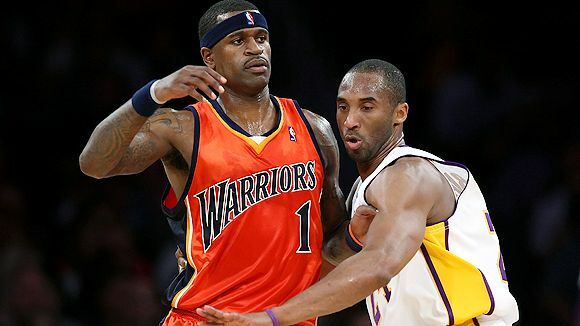 Apparently, Stephen Jackson is not done talking. After his much publicized blow-up during an exhibition game earlier this month against the Los Angeles Lakers where he picked up five personal fouls and one technical in less than 10 minutes, the former captain of the Golden State Warriors claims that Kobe Bryant is being allowed to play a certain way that affords him an unfair advantage. “To beat a dead horse, (Bryant) was just playing dirty,” Jackson told the San Francisco Chronicle. “He was getting favoritism out there. I’m not saying the refs were cheating. I’m not saying that at all. I think he was getting away with stuff that I couldn’t get away with, and I didn’t think it was fair. Jackson added: “I’m not a fan of Kobe. I’m not somebody who looks up to him. I’m a grown man, so when I go out there and play the game, I play the game. I feel like I’m just as good as him. I might not get the publicity or the notoriety he gets, but I feel like I can play with anybody in the NBA. This makes for an interesting Jackson-Bryant rematch next week when the Warriors play the Lakers again Tuesday in Ontario, Calif.